Khor Sach Ko, a slow-cooked Khmer stew, is a hearty beef and noodle dish. It has surprisingly complex flavors for such unpretentious, homely food. The dish, prepared for a staff dinner at Romdeng restaurant in Phnom Penh, is just one of the meals I enjoyed at the restaurant during my stay in Cambodia—it’s food I’ll be preparing at home. The flavor notes? 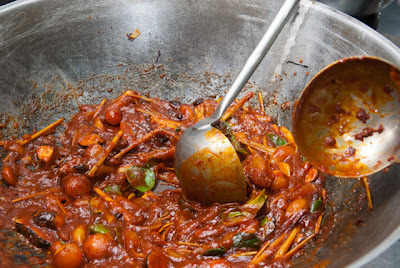 A tomato-enriched sauce developed around stir-fried whole shallots and cloves of garlic; big chunks of onion and fire-roasted galangal (with the roasty bits still on); crushed lemongrass stalks; kaffir lime leaves; and mild chili paste, hand-pounded. 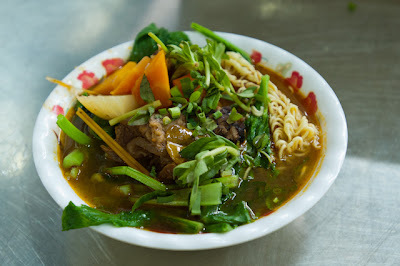 The stew is usually served over noodles or with bread, and topped with a mix of herbs. 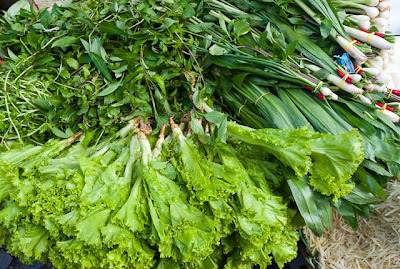 The finished bowl features spinach and salad leaves, Thai basil, “rice paddy herb”, and slivers of spring onion. I can see why Cambodians call this comfort food! When I volunteered for an afternoon of cooking with the Romdeng staff last week, this was the meal we made for 36 staff members, using six kilos of beef. That’s quite a bit heftier than the amounts I’m accustomed to preparing. Khor Sach Ko is not on the Romdeng menu or in the restaurant’s cookbook, Spiders to Water Lilies. I’ve asked for the recipe, with ingredient quantities scaled down to fit a family-sized wok, and when it comes, will post it.